Hi! I’m about to make this but I’m confused about one thing: In the list of ingredients it says 4 oz reduced cheddar cheese but in the directions it says “…add 1 cup”. So looking forward to trying it especially after reading all of the great comments!!! I can’t have dairy. Can I substitute rice milk or almond milk successfully? Delish! HH was a happy camper again! I subbed the bread crumbs with potato chips! Thanks for another super recipe! How much reduced fat cheddar does this call for? The recipe says 4 oz but the directions say 8 oz (1 cup). This is great comfort food. Used tuna in water in pouches, and had some veggies that I wanted to use up, Roasted red peppers, hearts of palm, fresh baby spinach and mushrooms all added. (skipped the peas)To slash carbs even used Miracle noodle with virtually no calories added. In this dish my husband even thought they were great .Versatile recipe to add what ever veggies have on hand. No problem getting sauce to thicken even with 2 tabs flour, I use King Arthur white whole wheat flour. Will do this one often. We love this! (Actually we love all your recipes, and I make them weekly!). I bake half of this recipe and freeze half for another night. Thank you Gina!???? Worked well! my only suggestion would be to add more butter to the saucepan before putting in the flour. Maybe I didn’t have enough to begin with, but when I added the flour it began to stick to the bottom and burn- had to add the stock quickly after that. Overall though, delicious recipe! Even my husband who isn’t a huge tuna eater was more than happy. Reminded me of when I was little and my mom would make this at home. 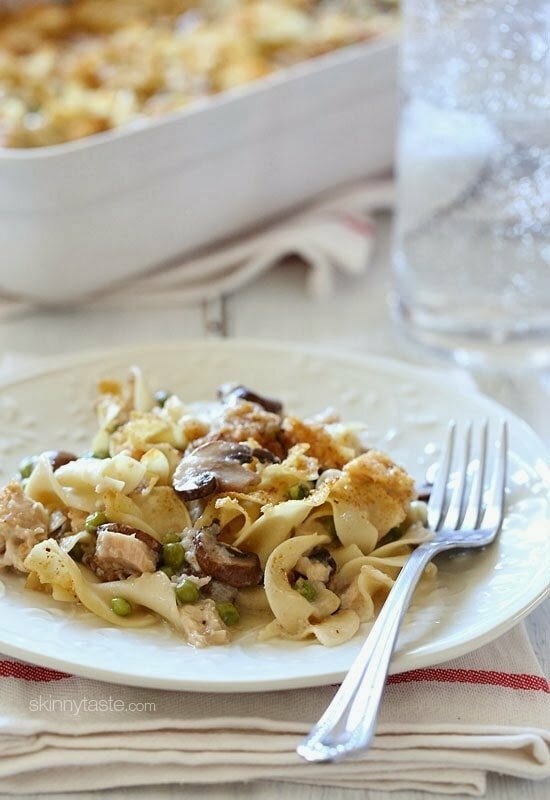 I never comment on blogs; but I just have to say that this is THE BEST Tuna noodle casserole I’ve ever had! I’ve made it twice so far and I can’t get over the deliciousness of it! Thank you! You’re recipe is officially a part of my family recipe book. This was amazing! My husband, who hates tuna casserole, loved it and asked me to make it again. I love that you do not have to use canned soup. I added some thyme and red pepper flakes for a little extra kick. Next time I will double the recipe – it went to fast. I would like to replace the noodles with Brown Rice. Has anyone tried that? This was awesome! My husband loved it! Great recipe…I liked that its made from scratch. You can tell by the freshness of the flavors. 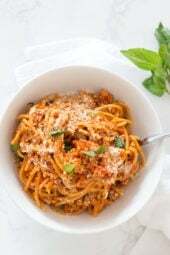 Im wondering if you have a spaghetti squash tuna “noodle” recipe or variation? I would love to see something like that! Should I freeze this fully cooked or uncooked? do you mean 6 oz of pasta or 16? i can’t imagine using just 6…. I made two pans of it and saved one for the second night because that’s my strategy lately — cook double everything and have leftovers the second night. The first night it was perfect, but the batch that I left in the fridge and baked the second night, the mushrooms were not as good. I think they got a little soggy from sitting. So yummy I had two helpings in one sitting! I made this for dinner last night and it was so good! My boyfriend loved it too! I added some red pepper flakes to the sauce, and a bit more when serving, and I think the bit of spice went really well with the rest of the dish. I forgot to add that I didn’t have sherry so I just used vodka. I will try it with sherry next time and see how that changes the flavor (this is definitely going in my recipe rotation!). The chicken broth defeats the purpose of a Friday Lenten dish… But I can't wait to try this in the future on another day! I’ve replaced chicken broth in recipes with vegetable broth for my vegetarian sister before, and it works well! I used vegetable broth. Easy fix! The chicken broth defeats the purpose of a Friday Lenten dish…. Looking forward to trying this in the future on another day. Does this reheat well. I'm only cooking for two people? Just tried this for the first time this weekend and it was amazing!! Definitely one of my new favorite recipes. 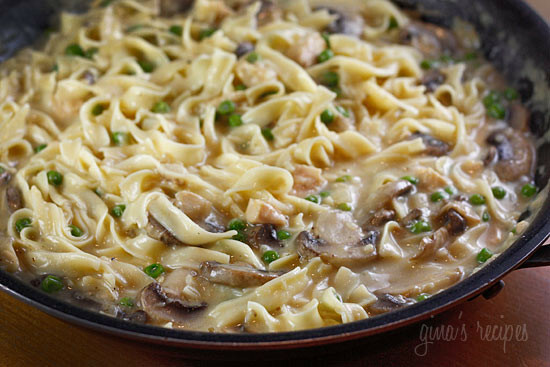 I've always made tuna casserole with the cream of mushroom soup and a full pound of pasta. I actually think this lighter/clean version tastes much better. It was like mom came over and made dinner on a Friday during Lent! Yum, comfort food at its best! Thank you! I made this last night and loved it. I followed the recipe with the exception that before I baked it I put half of it in the freezer to bake on another day. The other half I just baked in an 8×8 pan. Hopefully the frozen portion will taste just as good once defrosted and baked. What's the actual serving size amount in grams? Is there anything I can substitute for the chicken broth? I would like to make this tonight! I made this using zoodles instead of noodles, and left out the breadcrumbs. Naturally, it was quite a bit wetter, but it also lost a lot of points! It was delicious and I plan to make it on the reg! Hi Gina, do you know what the serving size is for this dish? I know it says 1/6th, but do you know what that is in oz? Thanks! Any recommendations for preparing in advance? Made this awesome recipe. Full of flavor and really easy to make. Usually already have most of these ingredients on hand. Will make again and again. This casserole really hit the spot when I was craving tuna casserole! I'm doing Simply Filling on Weight Watchers and used whole wheat egg noodles to make it more friendly! This was delicious! I made this tonight and my daughter gobbled it up, then asked for leftovers for lunch tomorrow. Thank you for sharing! My son wanted tuna casserole for his birthday dinner, and I had made this once before so so knew our was good. I used to make the canned soup version before. I replaced the peas with celery, because the peas made it too sweet for me, but also, I used to use cream of mushroom and cream of celery too make it before. We love mushrooms so of course we kept those. I will never make this casserole any other way again! It's so yummy, I just wanted keep eating it even though I was full and there was birthday cake! The sherry really adds to the flavor, don't leave it out. This casserole is the bomb! Second time making it and next time I WILL have to double it as my family of five inhales it. Do you think this could be easily doubled? Gina! Had to comment. My husband who does not even eat tuna could not get enough of this. Too funny! Great recipe! I use zucchini "spaghetti" Instead of pasta but thinking spaghetti squash might also be good. Following the recipe but using cauliflower Alfredo sauce thanks!! Hi- just found this recipe. What is the sodium content for this? It sounds yummy 🙂 thanks for sharing the recipe. My only negative would be that there is basically no seasoning in the original recipe, but that was a pretty easy fix. HI Gina! Long time & loyal skinnytaste reader/user – this is one that is on rotation twice per month! I used to hate tuna casserole,.. but I think it was because of the nasty canned mushroom soup my mom used! Thanks for bringing the classics back and making them healthy!! Found this recipe while searching for a crock pot recipe for the same. This is amazing! Made it tonight and left out the mushrooms. There was not a word said at the table as everyone was busy eating! Delish! Thank you for this recipe! I made this today using unsweetened almond milk, extra peas, and panko on top. Such a great recipe! This was amazing! So excited to have a tuna noodle casserole that does not use cream based soups! I used a bag of mixed vegetables for the peas and mushrooms. I think this would be good with some broccoli up in it. Just put this in the oven. It was a struggle not to just eat it right out of the pan! Thank you so much for yet another fantastic meal. Made this tonight. It was very tasty. I had Green Giant Brussels Sprouts with butter sauce on the side (1 point per serving.) Will try again in the future with chicken instead of tuna! Thank you for all of the Weight Watchers Recipes. I have made this twice and you must be patient with the sauce thickening. The first time I was not and although runny, it was still very flavorful. Great recipe. OMG This was a total hit, LOVE, LOVE, LOVE! Will make again and again! Forgot to mention that I opted for leaving out the sherry entirely. And, also, that I used an entire 12 ounce can of tuna and it was not too much. I grew up on Tuna Helper, so I was so excited to eat this. Unfortunately I'm lactose intolerant. I made it for my husband on Sunday and he has almost eaten the entire thing! I also tried a bite and it's SO good. I am going to make it again with substitutes!! I also bought broccoli to add for texture, but it was infested with bugs! EW! My husband said I definitely should add broccoli next time for some added texture! Thanks for the great recipe Gina! This has long been one of my favorite recipes on your site, I'm so glad you reposted it for those who may not have come across it yet! Your website has made me love to cook and has made it so easy to eat delicious food and still be healthy! Made this last night and it was delicious. It reminded me I have a request for you, Gina: could you please come up with recipes for cream soups that we can throw in the freezer as equivalents of a can of soup? So if I need a can of cream of chicken soup, I could pull out a freezer bag of it? I looked at your cream of mushroom soup (yum!) but I wouldn't know how to use it.Thank you for all you do. This is so delicious! I made a similar version with slight adjustments and posted it on my blog Vanilla Virtuosa. If you're interested, check out my other recipes, too! Absolutely Delicious! The sherry put it over the top. I made this just for myself, so I just cut the recipe in half . I had leftover evaporated milk, so I used that and it made it nice and creamy. I'll make this again! Thanks. Made this with shredded chicken tonight instead of tuna and it turned out awesome!!! Is this casserole freezer friendly? So excited to try this one. I'm a huge fan of tuna casserole, and I'm super excited to have a healthier recipe for it! Any clue what the points would be if I swamped the tuna for 10oz of cooked chicken breast? My husband said his mother used to make tuna casserole, and it was "alright" but he could "take it or leave it." I wanted to try this recipe, and so glad I did. The first time I made as written, but I switched out the vodka because I didn't realize I was out of sherry until I was in the process of cooking….but I always have a good vodka in the house. I have made this now 5 times by HIS REQUEST, so that tells you it's good! I stick with the vodka instead of the sherry since he loved it the first time. However, I have added a box of frozen spinach (thawed and drained) instead of the peas, a big bag of fresh arugula with the peas (love the peppery greens in this), broccoli instead of the peas, both spinach and peas, and I add a pinch of crush red pepper flakes when I add the veggies and the vodka. Next time I am thinking about chopped up swiss chard for a twist. This is a GREAT solid recipe! 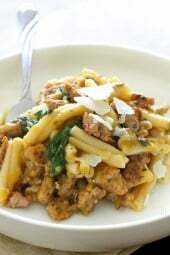 I had NEVER had tuna noodle casserole before I saw this recipe! And now every time I make this, I use broccoli instead of peas. Nothing against peas, I just had broccoli on hand the first time I attempted it and didn't want to change it! Bok choy sounds like it might be a good thing to add! LOVE it! OMG where did you get that spoon from it's amazing! Made this tonight! Super yummy!!!! I just used broccoli instead of peas, but everything else stayed the same My husband and one year old cleaned their plates! That spoon is adorable! and as always, the recipe looks fantastic! I'm a huge fan of tuna casseroles. Oh my goodness, pure comfort food! I absolutely love this, Gina. A definite must-make for soon! Can I freeze this? Or would that be a terrible mistake? Update – I didn't end up freezing it but the general concensus says yes. Anyway, made this yesterday morning and it was so good I ended up eating some for breakfast. This is SO DELICIOUS! I am wondering if I could use potatos instead of pasta. This looks wonderful. I have not made tuna noodle casserole in years but may have to make this now that we are into casserole weather. Cute serving spoon. 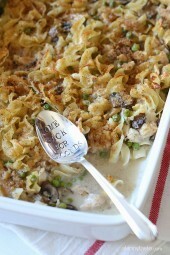 Skinny tuna noodle casseroles are the best! I haven't had it in years though – definitely need to make it soon! Looks great! Love this lighter version! I love the fact that this doesn't use canned soups. Thanks for sharing. It's dynamite.. I added some diced celery and broccoli for extra crunch, and I agree with some posters that panko breadcrumbs are the way to go for next time.. but it makes a ton of food and it will freeze great. Can't wait to make more of your dishes.. up next, Crockpot Sloppy Turkey Joes! Looks delish….but my family are not tuna lovers…So wondering if it would work with either canned salmon or crabmeat???? Just had to comment because I came to the site looking for the recipe for tuna casserole because I was pretty sure I'd made it from one of your recipes before and this popped up on the front page. I am taking it as a sign–dinner tonight! I know we'll love it since I've made it before, so happy for a tuna casserole recipe that doesn't used canned soup. Tuna casserole, an all time favorite staple in my family. It's easy & cheap to make, easy to substitute ingredients or add to it, AND it freezes well. This recipe doesn't use canned soup, which is how my Mom always made it. One thing I will keep with how my mom made it is instead of topping with breadcrumbs, use potato chips. I know it's not the most healthy, but it adds some flavor and texture. YUM! My 8 year old daughter usually turns her nose up at tuna, but I will be making this tonight and see what she thinks! I know i'll like it; I've loved everything I've ever made from your site and like others I cannot wait for your cookbook….everybody I know will be getting one as a gift! that is the cutest spoon! I just made this tonight, it was super easy and tasted great. I didn't have any 1% milk but used almond milk instead (couldn't taste any almond taste) and used frozen mixed veggies. it was a hit!!! Thanks! Dear Gina… you're my go to for healthy cooking! I made this TC tonight and it was better than any I recalled from childhood. I added about 1 oz of dry marsala wine instead of the sherry and it really added a subtle dimension to it. Otherwise I followed it to a T… My chef hubby really liked it. Just this week I made your butternut squash & spinach rolls, crab cakes with red pepper chipolte sauce accompanied by the southwestern corn, avocado & black bean salad. My cooking has become more interesting and diverse while being healthier thanks to you! I must have made at least 30 of your recipes and each has been a hit! I've made some similar Lidia's Italy recipes and honestly can't tell the difference. Keep it going girlfriend! What is your pan size? 9 x 13? This was absolutely fantastic! My new favorite. What a good recipe. Thank you ! I got sick on mushrooms many years ago. BUT, the good new is if I can't see them, I can eat them! No, I don't shut my eyes..I grind them up in a blender! I just made this! Firstly – I have never been able to produce an entree that matched the original posted picture. Totally a FIRST for me!! Secondly – I've converted the man into a casserole lover and found a healthy vehicle with which to feed him broccoli. Thank you so so so much for this recipe! I love your blog!!! I made this last night and it was a HUGE hit. I halved the recipe since it was just for me and my boyfriend. I didn't have mushrooms unfortunately, but I added some diced green pepper in with the onion to give it a little something extra. I also added 1 bag of fettuccine shirataki noodles to the 3oz of whole wheat spirals I used- the differing textures were great and my boyfriend actually complimented the pasta not even realizing. Because I used extra pasta, I used 2 cans of tuna, too. 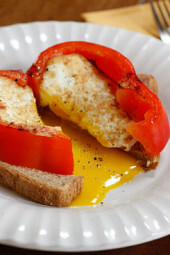 This is such a great recipe and I plan on making it again and again! This recipe is just awesome. Made it tonight for the second time and I just have to thank you! Love your website.